I have had the pleasure of designing and teaching courses at the New School University, the Freie Universität Berlin, and Goethe-Universität Frankfurt. My teaching experience includes both introductory and specialized courses at undergraduate and graduate levels. I first taught “Modern Political Philosophy” in 2006 as a Teaching Fellow at the New School for General Studies and was invited back as a Dean’s Fellow to teach the course again in 2007 and 2008. In 2012 a colleague and I designed an interdisciplinary MA-level course on “The History and Philosophy of American Pragmatism” at the Freie Universität Berlin’s Graduate School for North American Studies (GSNAS). 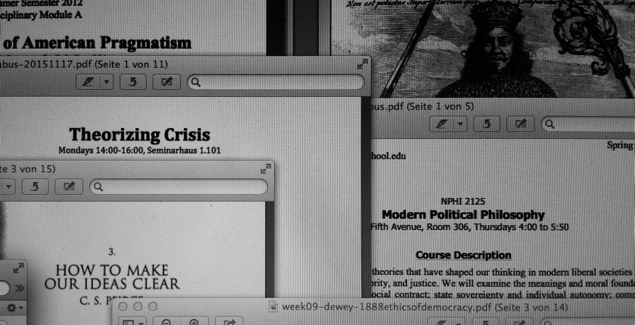 Most recently, I led a graduate seminar entitled “Theorizing Crisis” at Goethe-Universität Frankfurt, which covered a range of topics from the debate over emergency executive powers to Marxist theories of history to interpretations of the 2008 global economic recession. My experiences at these institutions have led me to develop an approach that stresses the ability of students to correctly identify and reconstruct arguments. This informs my approach to lecturing, where I teach students to concentrate not just on the ideas of major thinkers but structure of the arguments that lead them to those ideas, as well as their historical context and contemporary relevance. I also make it a point to have my students write early and often over the course of the term, as I find this gives me a chance to gauge the level of the class and identify students who require extra help quickly. It also helps them process the material more effectively, and through my feedback it gives them a clearer idea of my expectations in the course. These strategies have paid off, as my student evaluations consistently praise my ability to illuminate difficult material. I take teaching, learning, and research as continuous with one another, and I encourage my students to learn by becoming “researchers” in their own right. Even if most students do not aspire to be professional scholars, they can all still benefit immensely from direct experience with the knowledge-producing process. In political theory, this means learning not simply what important ideas and issues are but how they develop, in the history of political thought and in the course of ongoing contemporary debates. The better students understand how ideas and issues evolve, the better they become able to see themselves not just as consumers of theory but as participants in the political theory enterprise. At the New School, I designed my undergraduate “Modern Political Philosophy” class around my own research, framing the history of modern political thought as a series of responses to the challenge of the sovereign state: thus I opened with Hobbes and closed with cosmopolitanism. In addition to the standard canon, I selected readings that sought to build upon earlier contributions while critically engaging them—for example, Habermas as developments on Kant, then Nancy Fraser, James Bohman, or Seyla Benhabib as developments on Habermas’s Kantianism. This impresses upon students how the canon of political thought is more than a collection of dead texts, but a living, transgenerational project. The short volume by Susan Moller Okin and her colleagues, Is Multiculturalism Bad for Women?, has also been a favorite of mine. Beginning with Okin’s seemingly straightforward approach to the tensions between feminism and cultural diversity, the successive responses illustrate how a single issue can become progressively more complicated, as new considerations and perspectives are introduced to the debate. My final assignment was for students to independently “discover” for themselves and write about a political theorist not covered in the syllabus. They were told they would be evaluated on their ability to read, reconstruct, and critically engage a theorist’s major arguments and to develop a clear, organized argument of their own, backed by evidence. One challenge that has become increasingly important to me is making my generally theory-oriented courses accessible and relevant to non-theorists. I took pains in my seminar on “Crisis” to join philosophical themes with real-world events—in this case, the political aftermath of the 2008 economic crisis as it played out in Europe and the United States. I approached this seminar as an opportunity to expand my own theoretical repertoire into new areas, including law and political economy. I look forward to designing new courses in the future in which I can expand my own knowledge as well as that of my students.